If you follow me on Instagram, you’ll know I’m practicing up to hopefully someday become a grandma. (My oldest daughter Hannah is struggling with infertility and you can read her story here.) I’m mainly creating and crocheting baby blankets in hopes she will be blessed with a little one, but every now and then I just can’t help myself and have to make baby sweaters too! 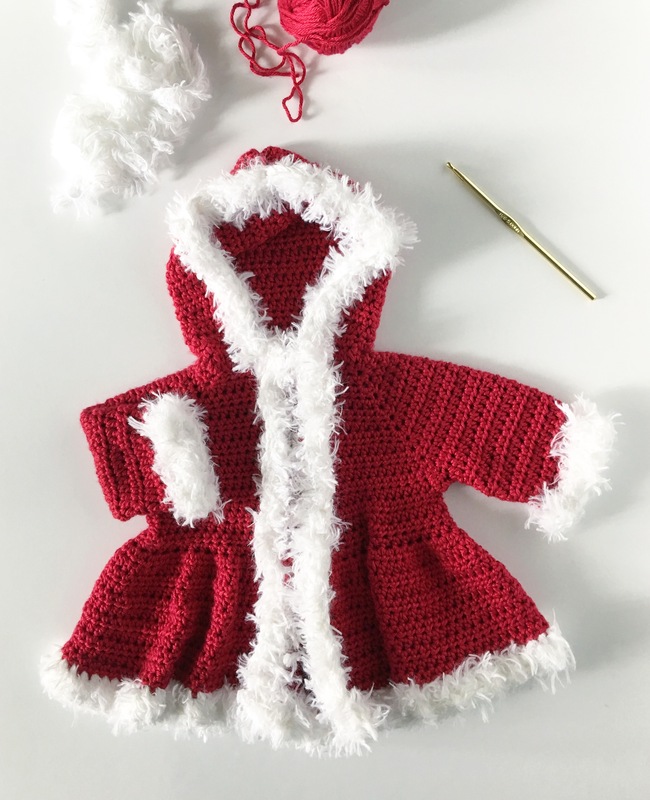 I made this crochet Christmas baby sweater over the weekend and I’m going to explain how I did it and I hope you can follow along. It’s very basic and all HDC. I think the finishing touch of the fur makes all the difference. But please forgive me for not giving you exact counts. I tend to not crochet that way. I’d rather tell you how and why I’m doing the stitches and where they are going instead of exact counts. Here are some ideas for you to consider if you need this pattern much bigger than I have made it. (It’s a size 9-month-old.) Measure the child you are going to make it for from the shoulder to shoulder, neck to waist, and shoulder to arm. I think this pattern could be adjusted as for as big as a six-year-old if you continue increasing in the neck/yoke area until the shoulder measures the width you need. And you easily could add length to the bodice, hood, and sleeves by adding more rows. One other idea is to use chunkier yarn, and/or a bigger hook. One last idea is to take a similar pattern that you already have for the size you need, make it all in red and add fur. Gigi is modeling the first version of a crochet Christmas baby sweater I made. I used China Silk yarn from Hobby Lobby and after the photo shoot with her, drooling and doing typical baby stuff, I am no longer recommending the yarn. It’s not colorfast and when Gigi was upset and started to cry a little the red bled onto the white fur and turned it pink. I’m still giving Gigi the sweater but I’m afraid it will only be for her to wear Christmas Eve. So, I made a second sweater using Caron Simply Soft in Harvest Red and the sizing remained the same. The only difference is a little bit of drape that is missing. It’s just a touch stiffer, but not by much. I think with more wear it will soften and be fine. And I know that Caron Simply Soft is colorfast and will not bleed onto the white fur. You will need to find white fur. I bought a skein at Hobby Lobby and it was called Snuggle Up. I combined it with a white strand of Size 2 weight cotton so it would be easier to crochet with and I highly recommend you do the same. It gives the fur more structure. Here’s a few more shots of Gigi, because she is so cute! Even when she is mad. I love her. Guage = 4 HDC per 1 inch. Size of sweater is 9 -12 months in US sizing. HDC in the next 8 spaces. 3HDC into the next space, HDC in the next 5 spaces, 3 HDC in the next space, HDC in the next 14 spaces, 3 HDC in the next space, HDC in the next 5 spaces, 3 HCD in the next and final 8 spaces. On the 9th row (or 11th for the bigger size) HDC to the corner. Work only 1 HDC, Chain 4, and then work 1 HDC in the next corner, skipping over all the spaces to form the armhole. Now work the bodice for 8 more rows working 4 HDC into the chains that you made under the arms. If they have pulled too tight, working around them is fine too. Work back and forth for the 8 rows, always chaining 2 and turning as before. In the next row, HDC in the first 5 spaces, then work 2 HDC in each stitch across working 1 HDC in each space of the last 5. Chain 2 and turn. Pull up a loop in the center of the armhole chains. CH 1 and then SC into the same space. (Make sure you are working in the right direction. (You want to work into stitches that are going in the opposite direction as if you had chained and turned.) You are going to be working an HDC into each stitch and work 4 HDC around the chain 4 that you made when you joined the armholes. Stop and count how many stitches you have made. The goal is 26. If you made more, undo and work a SC2tog or more if you need. Slip Stitch into the first SC you made. Work SC into each stitch, joining with a slip stitch. Do this for two more rows. On the last round, join the slip stitch with the fur. Chain 2. Work a DC in each stitch around. Tie off and weave in ends. Pull up a loop in a front corner of the sweater in the neck and chain 2. (Either side it doesn’t matter.) Work HDC into that first stitch and each stitch to the first corner. HDC3tog over the corner space. Work HDC in each stitch to the next corner. HDC3tog. Do the same for the remaining two corners. Chain 2 and turn. Work HDC in each stitch, always CH 2 and turn, for 21 rows. Bring hood together and either tie off and leave a tail to sew them together, or do your own preferred method for seaming. Weave in all the ends before you start the fur. In the bottom front corner of the sweater, either side, pull up a loop and chain 3. Work a DC with the fur up one side, around the hood, down the other and around the bottom of the sweater. Join with the starting chain, tie off and weave in the ends. Finish with sewing a clasp across the neck area. And guess what, if you made this, you were my pattern tester for the crochet Christmas baby sweater! Thank you! Let me know how I can improve the pattern, if you understand it well enough, and any other question you have by shooting me an email. I’d love to be crochet friends on Instagram! I also have a facebook page called Daisy Farm Crafts. I’d love to see your finished sweater, so post it on my facebook page or tag me on Instagram!